You are here: Home | Exhibitor search | Containment Service Providers Co. Ltd.
CSP provide a wide range of product packaging and containment application solutions including bottle bags, continuous liners, FIBC's, vacuum wanding, wall mounted fog shower and fog carts to the Pharmaceutical, chemical and food industries. 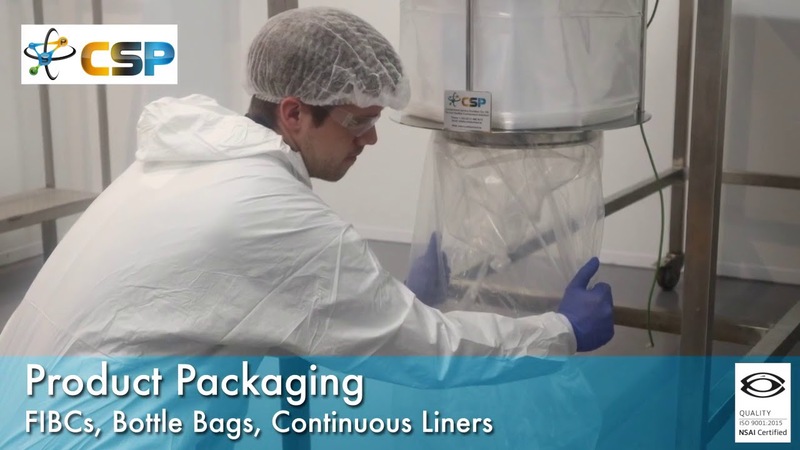 CSP’s continuous liner system is an easy to use contained packaging system that has been proven to be extremely effective in containing active pharmaceutical ingredients (API’s) and other hazardous substances. This continuous liner system assures a safe and effective powder transfer operation. An Occupational Exposure Band of Five (OEB5, <1µg/m3 occupational exposurelevel) has been demonstrated on this continuous liner system over an eight hour time weighted average (TWA). The CSP Continuous liner system is CE certified and our CSP Pharmaflex PE66 material is ATEX compliant disapative material. Contained product flow – protects the operators and the environment. Current good manufacturing practice ensures the product is contained and protected at all times. High containment processing and ease of use. Easy installation onto existing plant hardware / vessel. Inert atmosphere possible when offloading product. Significant reduction in cleaning time costs and waste material. The PE continuous liner cassette is pre-loaded ensuring ease of installation and minimising processing time. We currently have custom designed over 2500 flexible isolators for the pharmaceutical industry and these are installed on processes throughout the world ensuring safe and contained operations.